The Congress candidate is Ponnala Lakshmaiah, who had lost the seat last time to TRS’s Muthireddy Reddy by a margin of 32,695 votes. 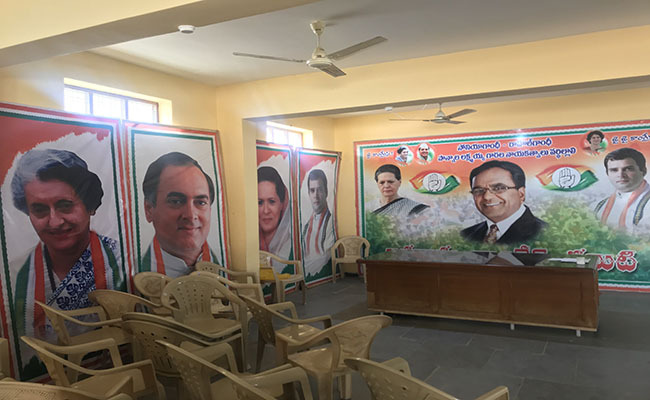 The Congress office in Jangaon is relatively empty when we get there, apart from a few party workers sitting scattered on white plastic chairs under a tent in the courtyard. A few others are inside the office packing up party flyers that would later be distributed throughout the constituency. The Congress candidate for the constituency is their own Ponnala Lakshmaiah, who had replaced the earlier announced candidate – Telangana Jana Samithi (TJS) founder-president Prof Kodandaram, as part of the Prajakutami, a grand alliance led by the Congress. Following a series of dramatic events, Kodandaram opted out of contesting at Jangaon, choosing instead to campaign for the Prajakutami. “The rest of them have gone for campaigning, these are just other posters that need to be distributed,” Dharmapuri Srinivas, a worker at the party office, tells us. “Ponnala Lakshmaiah has great support here. He won a general ticket as a BC. People have a lot of respect for him.” Srinivas goes on to say that the tussle between Kodandaram and Lakshmaiah for the seat has been made into a far bigger issue than it actually is and that it had no impact on the grand alliance. “Kodandaram sir is the face of the Prajakutami,” he beams. The Telangana Congress is leading the Prajakutami, a coalition along with the Telugu Desam Party (TDP), the TJS and the Communist Party of India (CPI), against its rival Telangana Rashtra Samithi (TRS). 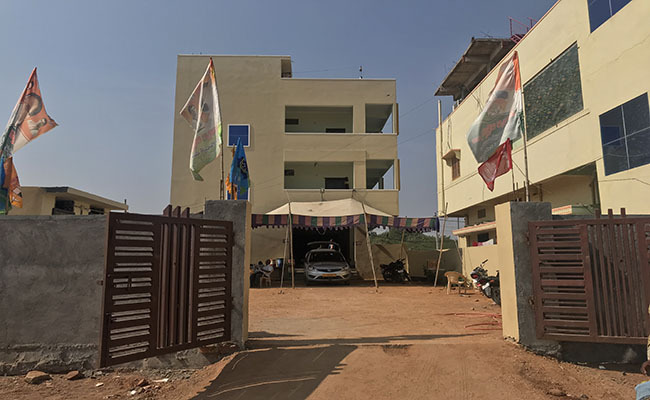 While the TJS had earlier wanted 17 seats for themselves as part of the coalition, the Congress announced 8 while the TJS announced it would be contesting from 12 seats, including Jangaon where Kodandaram was speculated to be given the ticket. Ponnala Lakshmaiah, former Telangana Pradesh Congress Committee (TPCC) chief, was given the seat following much speculation. After his name was left out from the first list of candidates announced by the party, Lakshmaiah had remained confident that the party would give him the ticket to contest the seat from Jangaon. Although primary reports suggested that the seat would go to Prof Kodandaram, he dropped out of the contest and chose to be the face of the grand alliance instead. In exchange, if the Prajakutami comes to power, he would be made chairman of the common minimum programme (CMP), which outlines the plans of the coalition government during its reign. It should be noted that Lakshmaiah also faces some dissent from within the party, with some expressing their displeasure over his selection despite his loss in the 2014 Assembly elections when he was the sitting TPCC president. The other main contenders from Jangaon are the sitting MLA, TRS’s Muthireddy Yadagiri Reddy, and the BJP’s KVLN Reddy (Raju). Interestingly, Lakshmaiah had lost the seat last time to Muthireddy by a margin of 32,695 votes. Not everyone, however, seems to share the confidence of the Congress party, with some constituents voicing their support for the TRS. 33-year-old Rajendran owns a small shop at the old bus stand in Jangaon and is all for the TRS coming back into power. “They’ve brought about good changes. We’ve been happy and living well under their government. Why wouldn’t we want them back? Whom else would I vote for?” he asks. On the other hand, staunch KCR supporters show what can only be called extreme devotion to the party. “It doesn’t matter to me who their (local) candidate is, whoever it may be, they will only do what KCR says and I know that KCR will only do good things for us,” says a frail but exuberant Yellamma (65), who scorns the possibility of anyone but TRS forming the government. “When my husband was alive, he never gave me a single rupee. But after he died, KCR is giving me Rs 1,000 per month, which they say will be increased to Rs 2,000 now,” she says referring to her pension. Yellamma also heaps praise on KCR’s Amma Vodi and Shaadi Mubarak schemes. “He’s done so many good things for women, to ensure they get medical care during deliveries and also arranging money for marriages,” she says. With such a split opinion, it’s hard to say for sure in whose hands Jangaon lies.